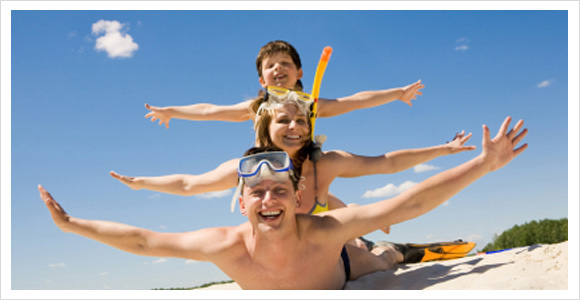 Compare FamilyTravel Insurance Policies and Save! Compare heaps of travel insurance policies to help you find the best cover to protect your family. There’s no better way to spend some quality time with the family than to go on a family holiday. Travelling with children may seem a bit daunting, but as long as you’ve got a reliable family travel insurance policy, the only thing you’ll have to worry about is keeping an eye on the kids. It’s a good idea to take out a comprehensive policy that will cover you for everything from medical expense to cancellation fees, accommodation, flights and luggage. This is especially important when travelling with a family, because it’s not just yourself you have to worry about. Family holidays can end up being quite a blow to the budget. You want to save money, but you can’t risk getting a low level of cover for your family. A good way to find an affordable policy, with the right benefits, is to use our website to compare family travel insurance policies. We let you compare different benefits that matter to you - that suit your needs and budget. Many insurers will cover dependent children for free on your policy, as long as they are travelling with their parents or grandparents for the entire trip. Some companies will cut off dependent children at age 18, while others may cover them for free until the age of 21, so it is important to read through the PDS of the insurer that you are considering to double check. If your child is working full time, they may also be excluded from this free cover, so it is important to clarify this before purchasing a policy. When booking your trip, make sure that your children have all the same travel arrangements as you so they can qualify for this free cover. Even if they are on one flight by themselves, they may be excluded from your policy. If your children are covered for free on your insurance policy, it usually means that they are sharing the benefits with you. For example, if your policy covers luggage up to $5,000, this amount will include any luggage claims made by you or your children. If you are carrying valuable luggage, it may be a good idea to specify particular items on your insurance. Family travel insurance doesn’t have to cost the earth, but it pays have adequate cover for everything you take on holiday with you, rather than paying later. Family holidays are often filled with fun activities, so you should also make sure that any adventure activities or snow sports will be covered. If you are heading to a warm beach paradise, read the PDS of your insurer to find out whether or not you’ll be covered for activities such as snorkelling, surfing, scuba diving and parasailing. If you are planning a ski trip to a winter wonderland like Europe or North America, you may need to pay an additional loading to get medical cover for ski accidents. Many companies also offer specific ski policies to cover things like lift passes and tuition fees. This additional cover may not be essential, but it can be well worth it if your child has an accident on the first day of skiing and you’ve prepaid a month of lessons and lift passes. No matter where you go on your family holiday, you’re bound to have an amazing trip full of fun activities, family bonding and unforgettable moments. A family travel insurance policy will give you the peace of mind to travel without having to worry about the unexpected! So start comparing family travel insurance policies now. On Yours Marks, Get Smart, Compare. For more tips on how to save, read our article for buying a cheap policy. Our online comparison simplifies the process of buying your cover, so you can spend less time trawling through websites and more ti...... Read more.